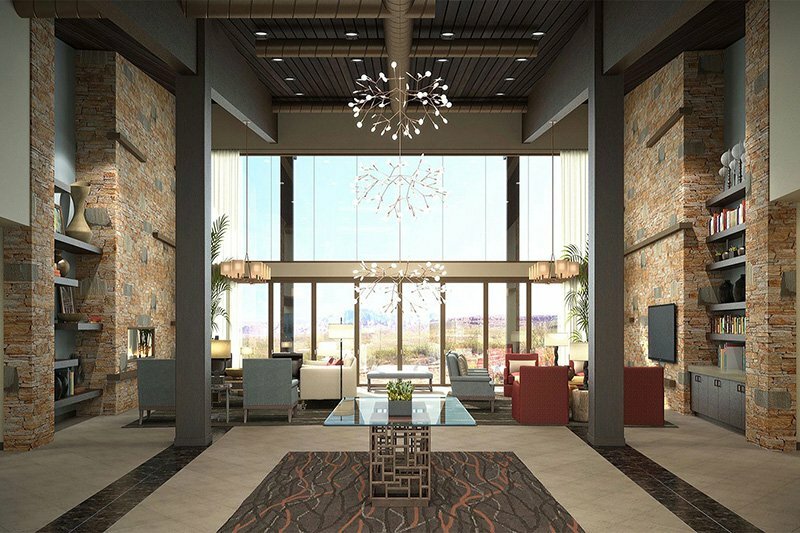 The clubhouse at Brio boasts a collection of resort-style amenities for Baby Boomers. It’s not just the location that makes Brio a special community, it’s the massive clubhouse that is a constant draw for active adults. This beautiful 14,500 square-foot amenity center combines the best of traditional amenities yet is housed in a modern building. Residents are struck by the 1,500 square-foot fitness center that has the latest, state-of-the-art equipment, sure to keep fitness regimens fresh. An expansive lounge greets residents upon entry and includes a flat-screen TV and an inset gas fireplace, perfect for striking up some casual conversation with new neighbors. The clubhouse at Brio also includes a card room and an indoor pool and spa, allowing for a refreshing swim no matter what the weather is outside. Perhaps Brio’s biggest strength is the long list of outdoor amenities. There’s the pool, spa, and patio for making the most of the warmer months. Two tennis courts and eight pickleball courts allow for neighborly competition. The grounds in Brio also include an event lawn and pet park. Grandkids will love to visit since Brio has an on-site playground. The picturesque quality of this 55+ community will be easy to appreciate with walking and biking trails that will have parks and the looming mountains as the backdrop. Jack Fisher Homes, a respected community developer, began constructing Brio in 2014 and upon completion the community will have 610 single-family homes. Jack Fisher Homes has built a reputation for developing sleek and modern homes throughout Utah and Colorado, and Brio is no exception. These homes will have open floor plans, opulent living rooms, one-floor living, while some feature additional master suites as well as large courtyards for maximizing the warmer months. There is a size and style to suit most tastes. Homes for sale in Brio range in size from 1,595 to 2,773 square feet with three or four bedrooms, two to three bathrooms, and an attached two or three-car garage. Although with the top-of-the-line amenities and incredible location, residents might not want to go home anyways. St. George is one of the fastest growing cities in the country and it’s easy to see why. Flanked by mountains in all directions, residents of St. George have nearly endless opportunities for hiking, skiing, and boating. Because of the temperate year-round climate, residents of St. George can ski in the morning and play golf in the afternoon. St. George also has a historic downtown district that has eclectic dining, concerts in the park, farmers’ markets, and a rich history that any lover of the Old West will love to explore. Brio in St. George seamlessly combines the historic with the modern in this exciting 55+ community in Southern Utah.